Monday was the best practice Scott Frost has seen from his team in a long time. Tuesday’s practice was awesome. Wednesday was just OK, the Husker head coach said there were some details that needed fixing but the effort was good. Thursday’s walkthrough was almost flawless. That’s how the head ball coach categorized his team’s week of practice coming off a canceled season-opener, so yes, he feels good heading into Saturday’s new season-opener against Colorado. Almost every coach has used some variation of the line “you improve the most between game one and game two,” and Frost alluded to that as well. But, he said the week of practice they had in the run-up to Colorado showed no signs of a team that hadn’t played a game yet. Their focus is squarely on Colorado. On Wednesday, offensive coordinator Troy Walters said a key for the offense on Saturday will be establishing the run. While that’s the case on any given Saturday, Colorado looked exceptionally good in the trenches in its opener. The Buffs rushed for 258 yards at 6.45 yards a pop while their defense held Colorado State to 103 yards at 1.48 yards per. Asked how the Huskers’ looked in the run game during the fall, Frost said things have been positive. It might be even more important given the guy Nebraska will be starting at quarterback… or so you’d think. “Playing a freshman quarterback… he’s ready. I don’t know how he’s going to respond when he gets that first snap but I have a pretty good idea he’ll be calm,” Frost said. “I think there’s going to be a mistake or two and we’re going to have to deal with that and go out and make plays to make up for it. Accomplishing that whole “don’t put the game on his shoulders” is a joint task. The Nebraska defense is going to have to slow a CU offense that looked as explosive as any in the opener. Quarterback Steven Montez topped 300 yards passing and had more touchdowns (four) than incompletions (three). Receivers Laviska Shenault Jr. and K.D. Nixon had 211 yards and 112 yards receiving, respectively, and a pair of scores. But Frost was careful not to give all the credit to just one guy. 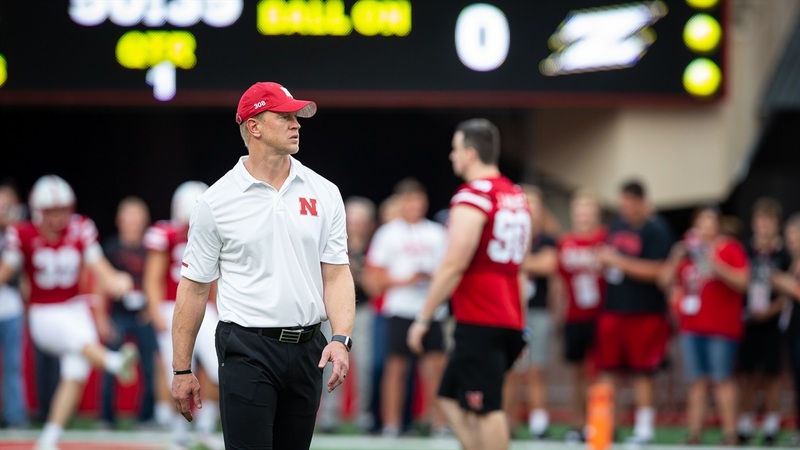 “I think they have other weapons, I think both their running backs can beat you, they’ve got several receivers that can beat you and I think they do a good job with scheme so we’ve got to make sure we execute,” Frost said. >> Frost said he was a little antsy coming out of the tunnel for the first time last Saturday but it’s good to have that first entrance out of the way, even if there wasn’t a first game that followed. >> Asked about his memories of Colorado, Frost said they were definitely a rival, but things are different now that he’s coaching. “As long as I’m here, we’re going to treat every game the same,” he said. “Fans and media and everybody can make rivalries rivalries. Rivalries are for the fans. We’re not going to prepare our players any harder or any less hard because we’re playing one opponent or another. >> Last week, Nebraska selected seniors Jerald Foster, Stanley Morgan Jr., Mick Stoltenberg and Luke Gifford as season-long captains. Frost said it was an easy choice.